The non antrhropomorphic Lingam form of Shiva is what is held in reverence in temples all over the sub continent. The Lingam is a symbol. It is a symbol of that which is invisible yet omnipresent. It is hence a a visible symbol of the Ultimate Reality which is present in us (and in all objects of creation ). The Shivalingam denotes the primeval energy of the Creator.It is believed that at the end of all creation, during the great deluge, all of the different aspects of God find a resting place in the Lingam; Bhrama is absorbed into the right, Vishnu to the left and Gayatri into the heart. The Shivalingam is also a representation of the infinite Cosmic Column of fire, whose origins, Vishnu and Bhrama were unable to trace. (see Lingodbhavar). Legend has it that Parvati fashioned a Shivalingam with a fistful of sand at Kanchipuram and worshipped Shiva; this lingam is known as the Prithvilingam, denoting the primordial element earth. Shivalingams in several temples are swayambus, or that which appeared on their own, or that which is untouched by a chisel. On the other hand, there are temples where the Shivalingam is carved out of stone and installed. The highly polished Shivalingams of the Pallava period bear several stripes, as in the Kailasanatha temple at Kanchipuram. 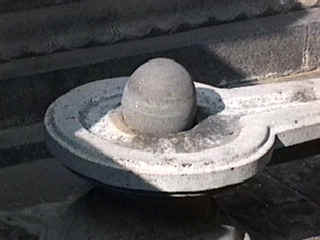 The Shivalingam is generally mounted on a circular or quadrangular receptacle called the Avudaiyar. This pedestal is designed so as to drain off the water offered during ablution ceremonies. In temples such as Kanchipuram, abhishekam is offered only to the pedestal and not to the Shivalingam made of sand. The bottom of the pedestal represents Bhrama, the octogonal middle represents Vishnu and the upper circular portion represents Shiva. The upper portion of the Shivalingam may be of various shapes, cylindrical, elliptical, umbrella shaped. Images may also be (rarely) carved on a Shivalingam. Nandi, the bull is depicted facing the sanctum in all Saivite temples, symbolizing the human soul Jeevatma yearning for realizing its oneness with Paramatma, the ultimate reality. Typically, the processional bronze images of Shiva are those of Somaskanda, Chandrasekhara, Bhikshatana and Nataraja. Although in most Shiva temples, the central shrine enshrining the Shivalingam is of the greatest importance, the Nataraja shrine is of greater importance at Chidambaram, the Somaskandar - Tyagarajar shrine is of greater significance at Tiruvarur.